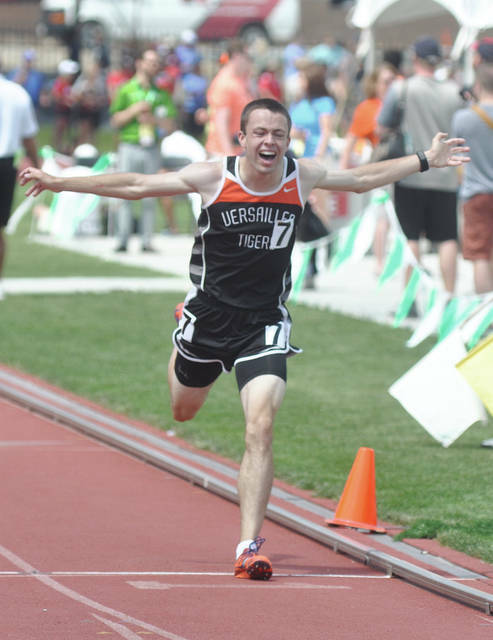 Versailles’ Joe Spitzer reacts to winning the 3,200-meter run at the Division II state track and field meet in June. Spitzer recently won the Emerging Elite two-mile run at the New Balance Nationals Outdoors meet in Greensboro, N.C.
Versailles High School graduate Joe Spitzer took his success to another level recently at the New Balance Nationals Outdoor meet, while a group of Covington girls also had a strong showing as well at the meet in Greensboro, North Carolina. For Spitzer, who was coming off winning the Division II boys state championship in the 3,200-meter run, it was a chance to step up in competition in the Emerging Elite, two-mile run. And Spitzer went in with high expectations. “I looked at the times ahead of time and saw I had one of the better times, so my goal was to win,” Spitzer said. And he said his strategy in the two-mile event didn’t vary a lot from his state championship run. “I kind of approached like I did at state,” Spitzer said. “I wanted to be in the top five or six at the midway point, then wanted to move up and take the lead with one lap to go and win. That is pretty much what happened. Spitzer, who won by more than five seconds with a time of 9:24.06, will be running at Liberty University next year. The Covington girls 1,600-meter relay (Breanna Kimmel, Paige Boehringer, Morgan Lowe, Rayna Horner) was coming off winning the D-III girls state championship, while Lauren Christian finished third at the state meet in the shot put. Kimmel and Horner both graduated, while Boehringer and Christian will be seniors and Lowe will be a junior. The five raised money to make the trip — with assistant coach Jason Sutherland. The relay team finished seventh in the Emerging Elite 1,600 relay in 3:58.68, while Christian finished 29th in the Championship shot put with a put of 40-3 1-2. Horner, who will run for Toledo University next year, agreed. And the heat was on from the start. Horner said it was different than running at the state meet. Kimmel — a four-time state qualifier — isn’t sure if she will run in college. Horner feels like the meet was good preparation for her college career. Where both Spitzer and the Lady Buccs showed they can compete with the best. https://www.dailyadvocate.com/wp-content/uploads/sites/34/2018/07/web1_joewins.jpgVersailles’ Joe Spitzer reacts to winning the 3,200-meter run at the Division II state track and field meet in June. Spitzer recently won the Emerging Elite two-mile run at the New Balance Nationals Outdoors meet in Greensboro, N.C. Rob Kiser is Sports Editor for the Piqua Daily Call. He can be reached at (937) 451-3334. This entry was tagged Joe Spitzer, New Balance Nationals, Versailles. Bookmark the permalink.